With a stunning coastal location in the exclusive neighborhood of Santa Barbara, Luneta Plaza is a luxurious private residence that makes for a glamorous intimate wedding celebration or elopement. Its Pacific Ocean-backed lawns provide a cosy space to exchange vows, while the sheer opulence of the mansion provides a spectacular setting for getting ready photos and couple portraits. 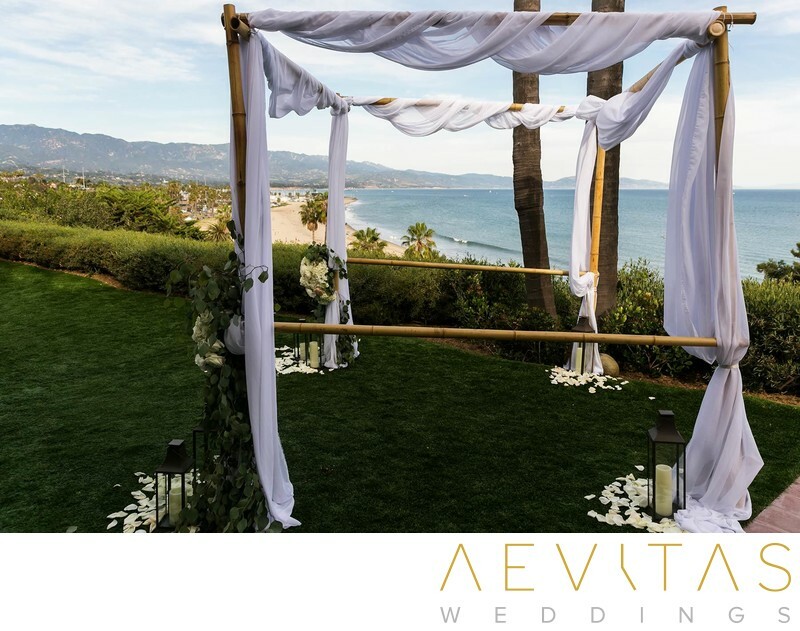 Views from the ceremonial lawns stretch across towards the Channel Islands and along the Santa Barbara coast, with the option to personalize the space with a bridal arch or flower-adorned aisle. Opt for a late-afternoon ceremony and you can not only take advantage of the most atmospheric light in your wedding photos, but your guests can also watch a spectacular sunset over the ocean during the cocktail hour. You can either host your reception on the same ceremonial lawns, with the capacity for just your closest family and friends, or head indoors to their elegant dining space for a more intimate affair. The floor to ceiling glass means that you never lose the sweeping Santa Barbara view, with a hammock strung idyllically between the palm trees if you really want to capture the elopement essence. There are four bedrooms where you can host your bridal party for a long weekend, as well as a hot tub for an indulgent soak. After celebrating your special day, you can explore the charming Montecito area of Santa Barbara, head into the Santa Ynez Valley for a day of wine tasting, or explore the nearby Ojai Valley to sample its renowned cuisine. Luneta Plaza Santa Barbara is a perfect wedding venue for couples wanting an indulgent weekend away for just themselves or those closest to them, with exclusive use of the private estate, right on the doorstep of everything Santa Barbara has to offer.